Obviously the cake must be delicious. Though it cannot be too hard to make because I would be working in my friend’s kitchen with a whole bunch of busy bakers all at the same time. Ideally the cake should be photogenic yet easy to slice. And of course I wanted to push my own baking limit just a bit to make an interesting challenge. My first cake was Persian Orange Almond Cake with Figs & Quince. This cake is special because of what it does NOT contain: flour, oil, dairy are nowhere to be found. It’s almost magical. For my second cake, I initially thought of making an entremets that is a sweet twist on salad caprese. I came up with all the individual components and it was only a matter of execution. Alas, life threw me a twist and I am back in survival mode. Perhaps one cake was good enough. A few days before Cake Day, I was haunted by the pastel beauty of prinsesstårta. I imagined how stunning a pale green domed cake would look on the cake table, especially with a jaunty little pink rose on top. I checked out some directions on assembly and it looked surprisingly approachable. 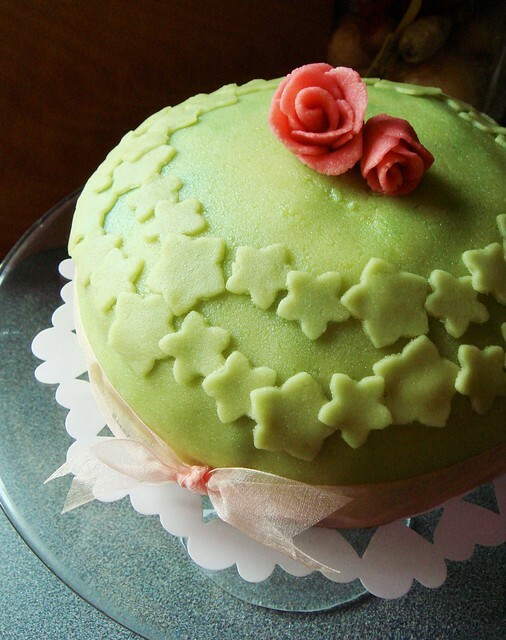 I could get away with making a prinsesstårta ahead of time and simply bring the fully assembled cake to my friend’s. 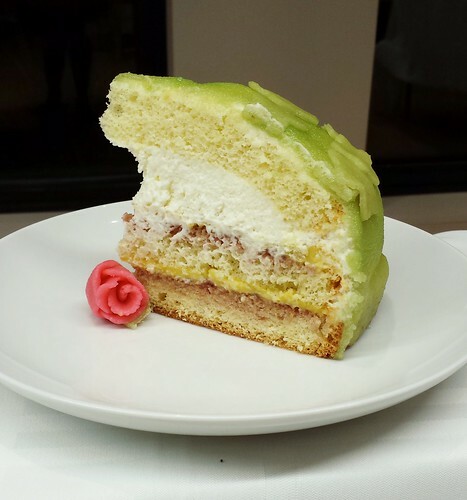 Surely I could pull off a cake made with layers of sponge cake, raspberry jam, custard, crème Chantilly, and marzipan? I remained non-committal until I had sponge cake in the house. You see, sponge cake has always been my baking nemesis. Tall, tender, and pliable are hallmarks of a well-made sponge cake yet I don’t recall the last time I achieved this trifecta. I adapted David Lebovitz’s recipe using duck eggs baked in a 9” spring form pan. It was…perfect. I could not believe my eyes. I made 2 cups of pastry cream with 4 yolks, 300mL whole milk, 100g sugar, 2 tablespoons cornstarch, and 1/2 teaspoon vanilla bean paste. 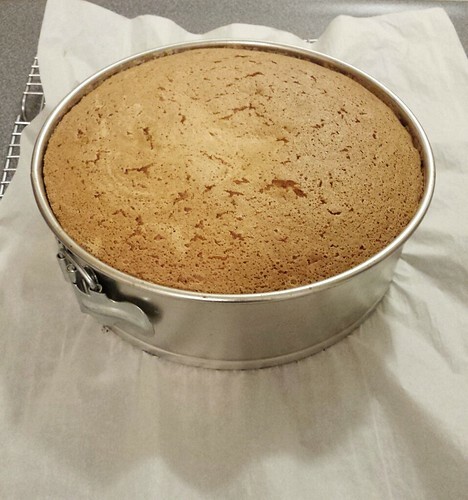 1/2 cup of homemade raspberry rose jam was divided evenly between two layers of sponge cake. 2 cups of heavy cream was whipped to stiff peak with a bit of sugar, vanilla, and two packets of stabilizer. 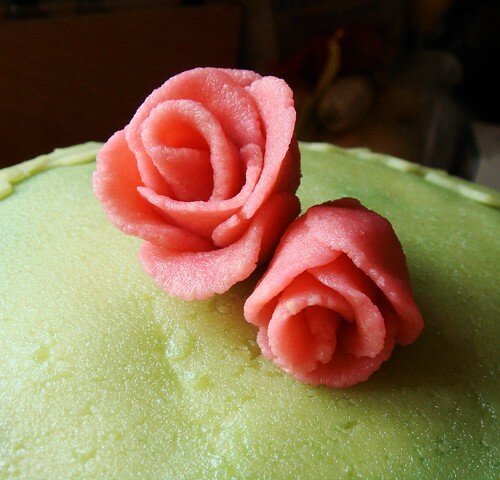 400g of marzipan was divided, tinted, shaped into roses and thin circle. Assembling the cake was not the easiest thing in the world but as you can tell from the photos, the result was stunning. As for taste? It was spot-on. You can imagine with such a classic combination of components, there is no room to hide any errors. The sponge cake was tender. The jam added a hint of tartness. The custard was rich and smooth. The crème Chantilly was fluffy. The marzipan was thin enough to provided a bit of sweetness without overpowering the delicate dessert. 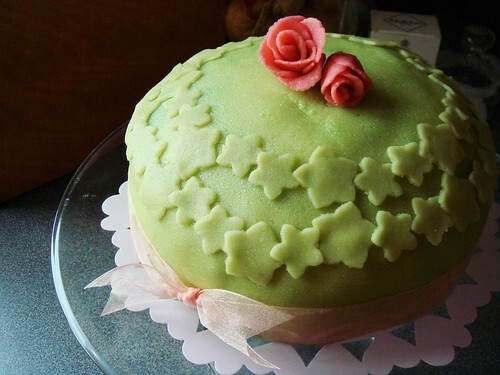 I was very pleased with my prinsesstårta. You don’t seriously think I stopped at just two cakes, do you? Last year I recalled plenty of leftover frosting in a great assortment of flavours. Thinking ahead, I brought along a dozen unfrosted vanilla cupcakes just in case. 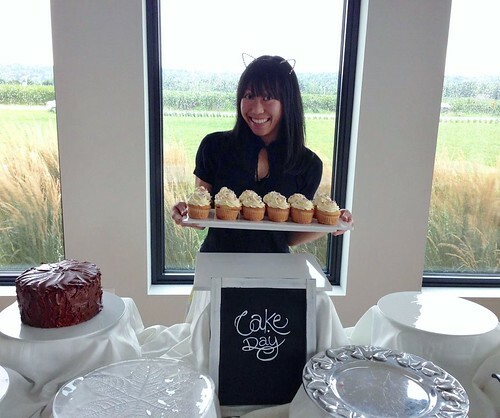 They came in handy to receive Y’s wildly delicious yuzu Swiss meringue buttercream. I topped the swirls with a bit of sparkly sanding sugar and pastel sprinkles for some girly treats. Cupcakes, the original leftover saviour! How silly that we actually go out of our ways to make cupcakes now, right? 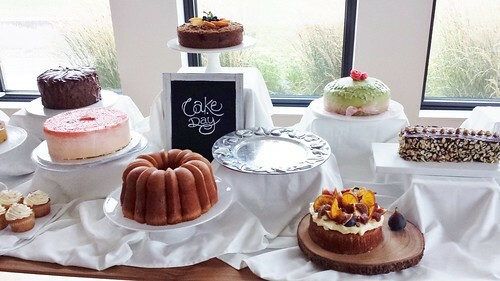 Check out foodpr0n’s amazing photos of all the cakes (with links to recipes!) and her redemptions on Cake Day 2014!